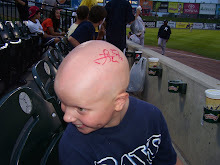 Autographs 4 Alopecia: Game 7: Gone Fishin! If you've followed our site for the past few years, probably the Bridgeport Bluefish have gotten the 2nd most coverage to our hometown Lancaster Barnstormers. 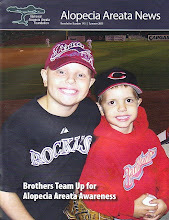 Bridgeport has always been our "other" team in the Atlantic League mostly because of Luis Lopez and Adam Greenberg. They were in town this weekend and dad and Gavin were going over Saturday night. Gavin was really excited to get to see Luis again and was even sporting his all star shirt from 2011! They got there early and Gavin had his Bluefish cards out to sign. Adam Greenberg is on the DL and didn't make the trip but we did have other Bluefish cards to get signed. Gavin got to talk to Luis for a while and fill him in on our seasons and hear about how the Bluefish were doing too. One of our other favorite former Barnstormers, Iggy Suarez, is now with the Bluefish so it was fun catching up with him as well. All the other guys signed and were really nice, especially Alexis Gomez. He introduced himself to Gavin and talked for a couple of minutes while signing some cards. After we went home we did find some more cards of him too! We can't wait to see the Fish again and are excited because they will have a team card set this year for the first time since 2008! He wore his new wrist band to bed!